This initiative phase begun in 2009 and now complete, had the aim of introducing the local community to the overall project and inviting them to become collaborative participants. 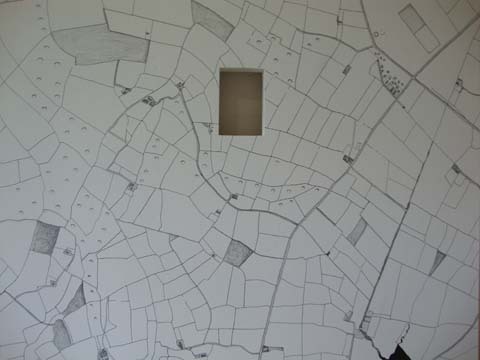 It entailed the gathering of field-names on the farms which surround our property in the townland of Tullabrin, the establishment of a project blogsite and the staging of an exhibition in Johnswell Hall as part of the Visual Arts Programme of Kilkenny Arts Festival in August 2009. 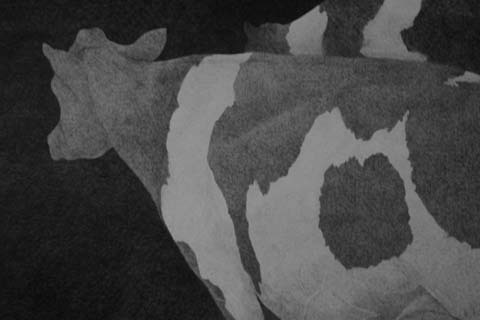 The exhibition comprised a presentation of photographs and drawings by project collaborator, Gypsy Ray, of farmers and their animals at the old Kilkenny Livestock Mart and of local landscapes. Images of local landmarks, fields and farm practices were projected on a large scale within the hall interspersed with the names of fields already gathered. A sculptural installation composed of local maps of the townlands created by the project initiator, Alan Counihan, was also on view. Most importantly, given its goals, the exhibition also contained a Process Room in which several Six Inch Ordnance Survey maps of the Townlands were on display. A handout was provided to all visitors encouraging them to identify their fields and to become participants in the overall project. The response to the exhibition was most encouraging with a great many farmers and households volunteering participation. On the basis of the enthusiastic response from the local community to this phase of the project it was decided to seek support for its further development.